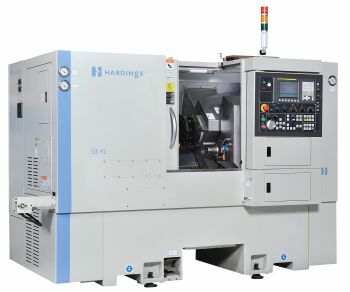 Hardinge Inc. has announced the release of four new turning centers - the GS 42MS, GS 51MS, GS 150MS and GS 200MS. These small-frame machines are ideally suited for small-to-medium size workpieces and offer expanded levels of functionality to address complex parts, resulting in increased throughput and reduced cycle time in a single setup. Both the GS 42MS and GS 51MS machines feature collet-ready main spindles, while the GS 150MS and the GS 200MS models are chuck machines and are supplied with 3-Jaw chucks. The GS 42MS and 150 MS are equipped with an A2-5", 6,000 RPM main spindle, while the GS 51MS and GS 200MS offer a larger A2-6", 5,000 RPM main spindle. Sub spindles, live tooling, C-Axis and Fanuc 0i-TD controls are standard on all models. Options include parts catcher, part probe, tool probe, chip conveyor, servo or hydraulic tailstock to name a few. "The all-new GS machines offer Hardinge quality and performance to users who need enhanced functionality at an excellent price," states Andy McNamara, Director of Sales and Marketing North America.